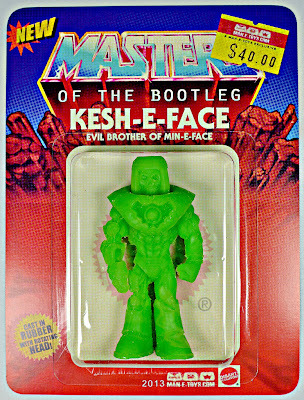 WHAT: Kesh-E-Face is another recent creation from Zectron, the artist behind other fantastic custom keshi such as the Critters-inspired mini figure, Lobsterman and the Madball of Death. Drawing upon Masters of the Universe for inspiration--specifically appearance-shifting character Man-E-Faces--the figure's head is attached to its body by a small magnet so that you can rotate between three different faces. 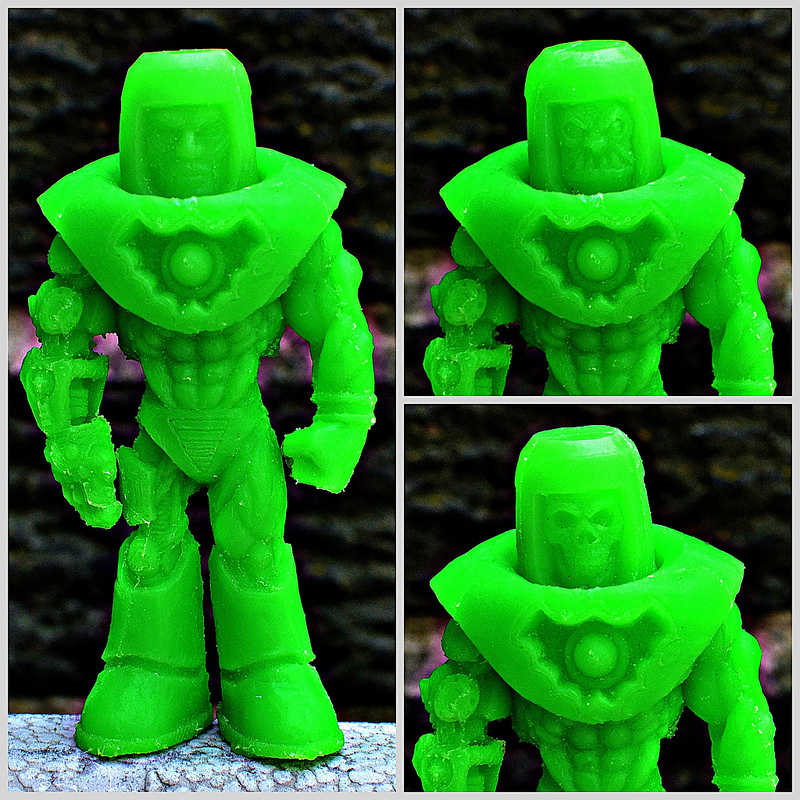 As with Zectron's multi-piece feature for his Madball of Death, Kesh-E-Faces rotating head makes it an extra fun and impressive piece that stands out from most similar custom mini figures. Kesh-E-Face is around 3" tall, making him larger than most keshi, but still a figure that fits in nicely with any collection. The larger size allows for greater detail, such as his mechanical arm which brings to mind another Masters of the Universe character, Trapjaw. Actually, the mark of a few different Eternia residents can be seen on the figure; in addition to the Man-E-Faces and Trapjaw elements, there's Skeletor (one of the faces), Ram-Man (upper body/shoulders) and Hordak/Mosquitor (the design on the chest). As with his other pieces, Zectron collaborated with Man-E-Toys' (whew, all these dashes) Tru:Tek to bring his sculpt into life as rubber (and magnet). 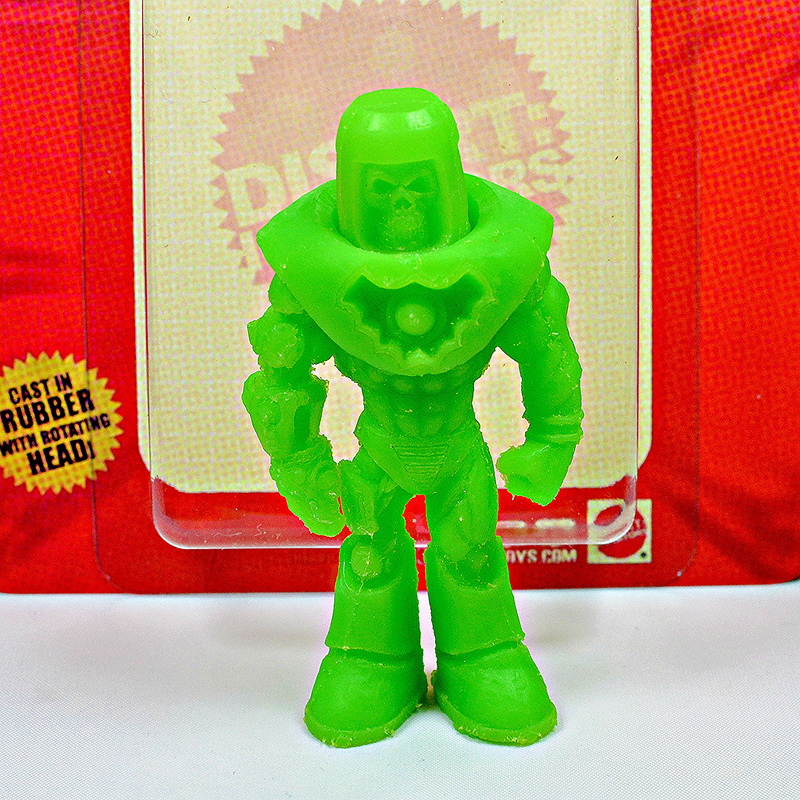 The figure has been cast in a variety of colors since its initial release, from monochromatic (like my neon green one pictured here), versions with different colored heads and bodies, and even swirled color pieces. To further add to the appeal, the figure comes packaged in a blister pack that's a take on classic Masters of the Universe packaging with blue and red graphics and the line's logo updated to "Masters of the Bootleg." Kesh-E-Face is an excellent homage to one of the most popular 1980s toy and cartoon properties, and anyone into either Masters of the Universe or rubber mini figures should appreciate this guy! WHEN: Kesh-E-Face first became available in early 2013, which different versions/colors of the figure being released periodically since then. WHERE: The figure has been available at various conventions as well as online through the Man-E-Toys shop. At the time of writing this, there is a blue and orange swirled version still available in the shop. WHO: Kesh-E-Face was sculpted by Zectron and has been cast/sold in rubber by Tru:Tek.